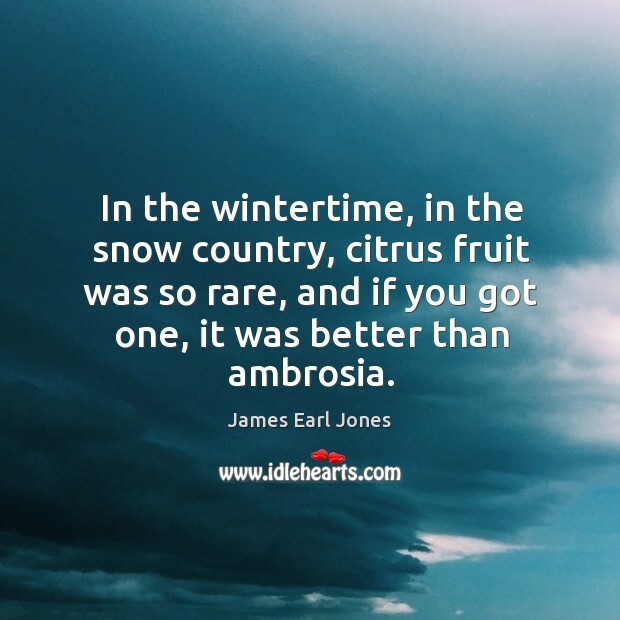 Quotations about Ambrosia. Quotes to stimulate mind and drive action! Use the words and quote images to feed your brain inspiring things daily! 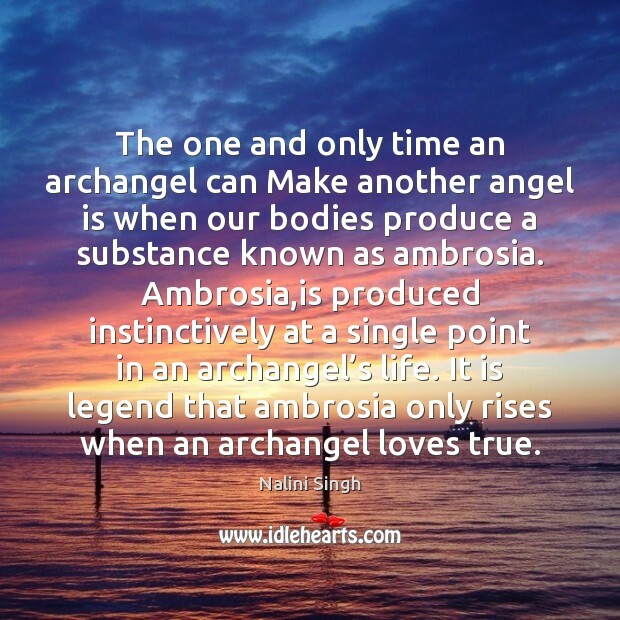 The one and only time an archangel can Make another angel is when our bodies produce a substance known as ambrosia. Ambrosia,is produced instinctively at a single point in an archangel’s life. 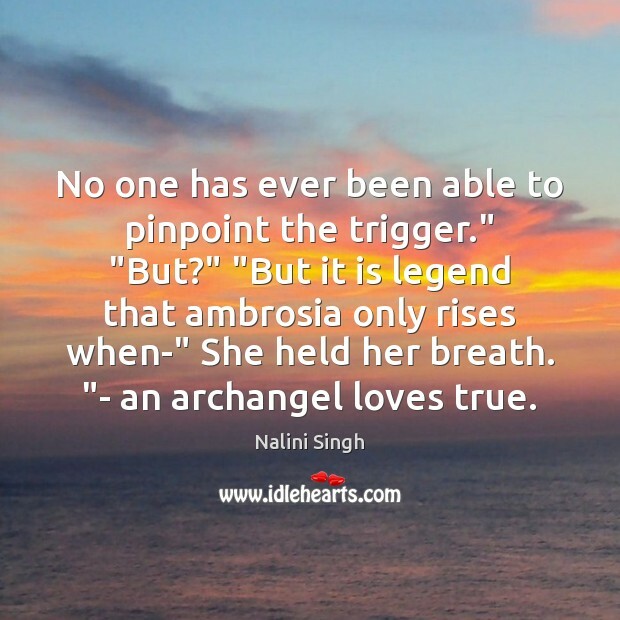 It is legend that ambrosia only rises when an archangel loves true. 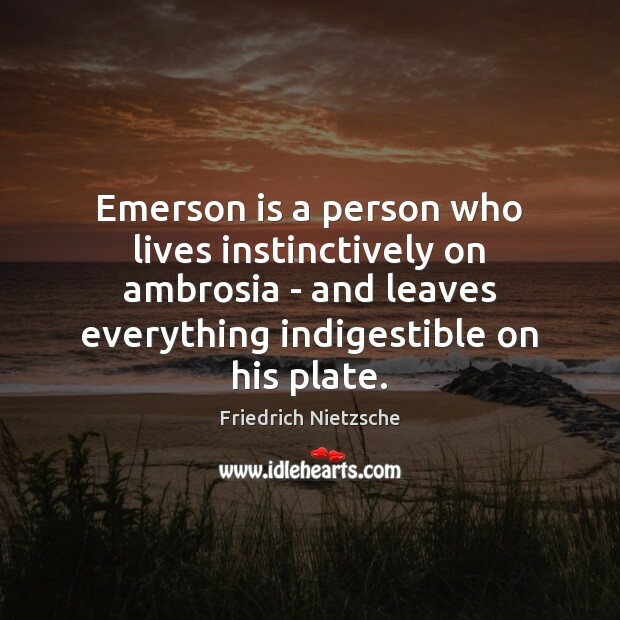 Emerson is a person who lives instinctively on ambrosia - and leaves everything indigestible on his plate. 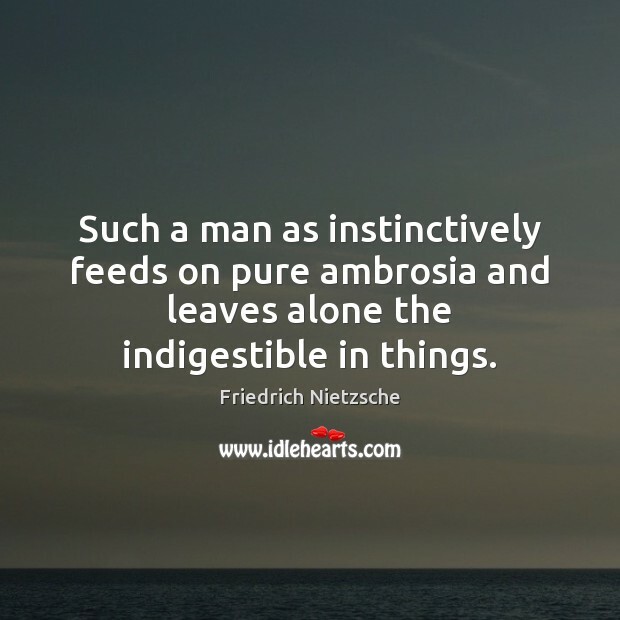 Such a man as instinctively feeds on pure ambrosia and leaves alone the indigestible in things. 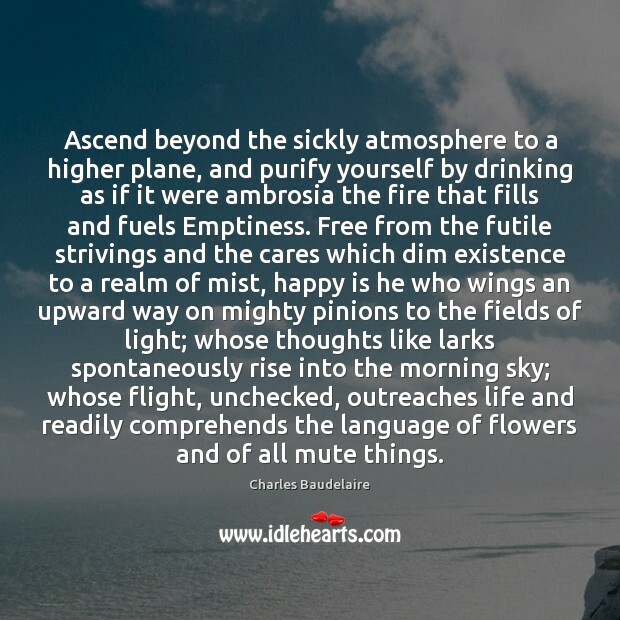 Ascend beyond the sickly atmosphere to a higher plane, and purify yourself by drinking as if it were ambrosia the fire that fills and fuels Emptiness. Free from the futile strivings and the cares which dim existence to a realm of mist, happy is he who wings an upward way on mighty pinions to the fields of light; whose thoughts like larks spontaneously rise into the morning sky; whose flight, unchecked, outreaches life and readily comprehends the language of flowers and of all mute things. No one has ever been able to pinpoint the trigger." "But?" 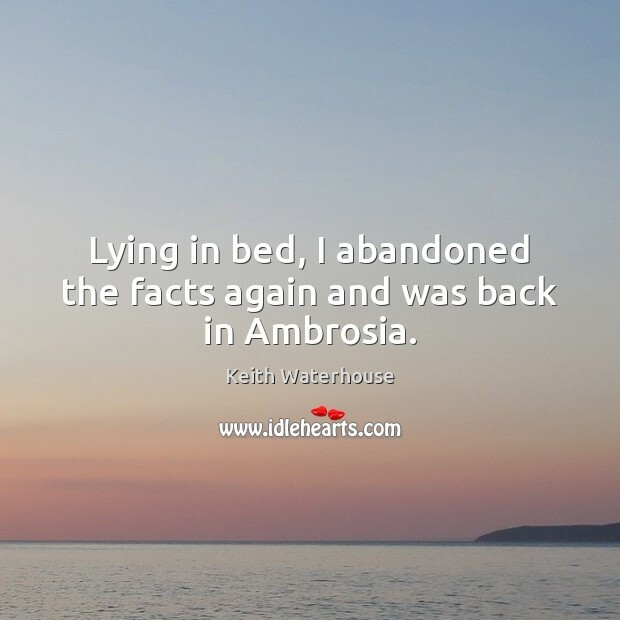 "But it is legend that ambrosia only rises when-" She held her breath. "- an archangel loves true. 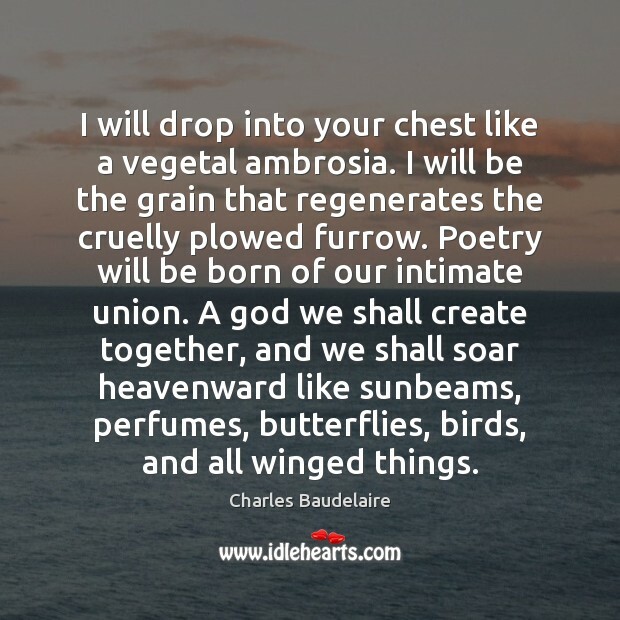 I will drop into your chest like a vegetal ambrosia. I will be the grain that regenerates the cruelly plowed furrow. Poetry will be born of our intimate union. A god we shall create together, and we shall soar heavenward like sunbeams, perfumes, butterflies, birds, and all winged things. I thought this was a cookout. 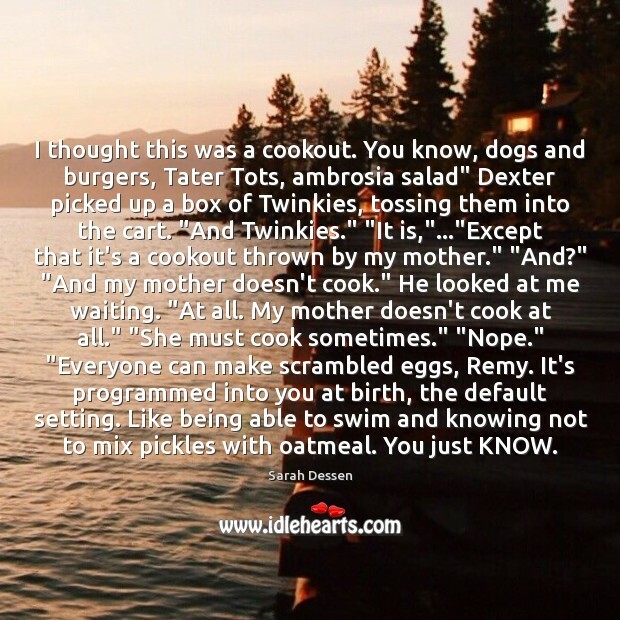 You know, dogs and burgers, Tater Tots, ambrosia salad" Dexter picked up a box of Twinkies, tossing them into the cart. "And Twinkies." "It is,"..."Except that it's a cookout thrown by my mother." "And?" "And my mother doesn't cook." He looked at me waiting. "At all. My mother doesn't cook at all." "She must cook sometimes." "Nope." "Everyone can make scrambled eggs, Remy. It's programmed into you at birth, the default setting. Like being able to swim and knowing not to mix pickles with oatmeal. You just KNOW. 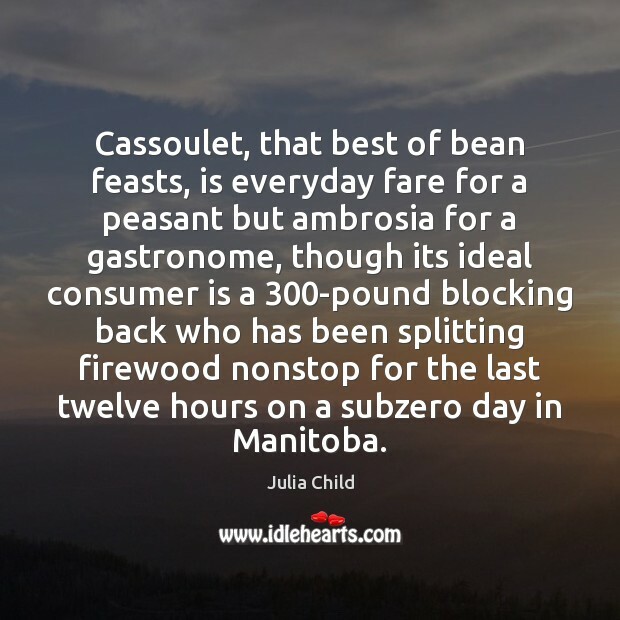 Cassoulet, that best of bean feasts, is everyday fare for a peasant but ambrosia for a gastronome, though its ideal consumer is a 300-pound blocking back who has been splitting firewood nonstop for the last twelve hours on a subzero day in Manitoba. 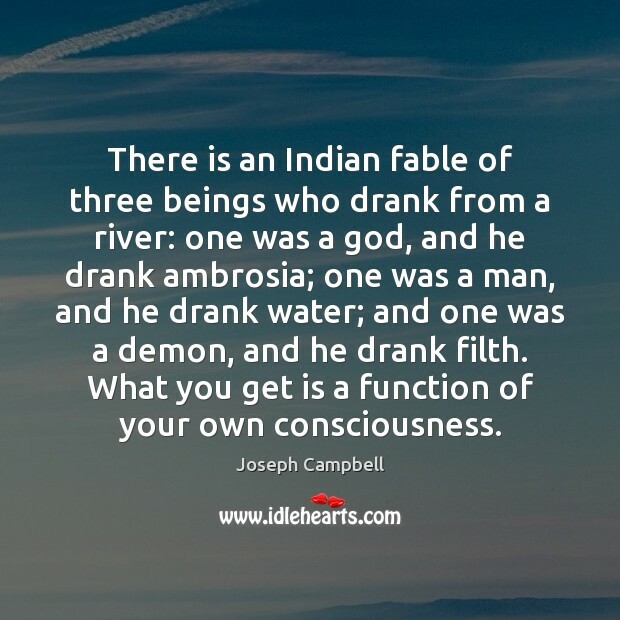 There is an Indian fable of three beings who drank from a river: one was a god, and he drank ambrosia; one was a man, and he drank water; and one was a demon, and he drank filth. What you get is a function of your own consciousness. For me, fishing and journalism touched the same places in my head. 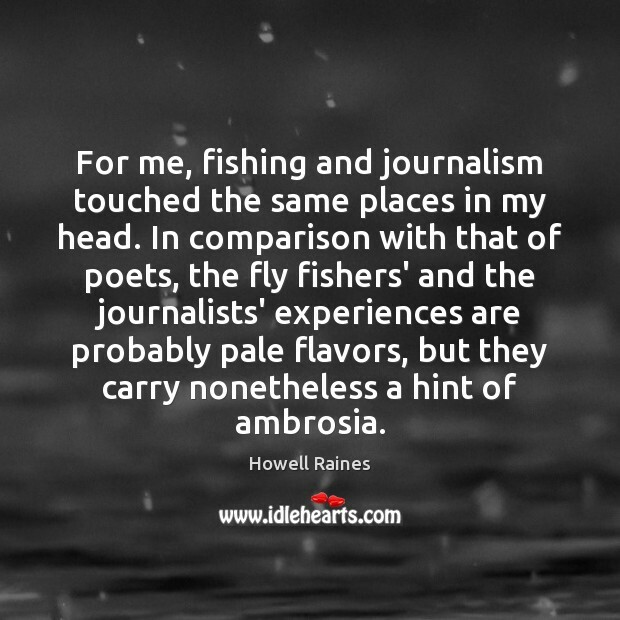 In comparison with that of poets, the fly fishers' and the journalists' experiences are probably pale flavors, but they carry nonetheless a hint of ambrosia. 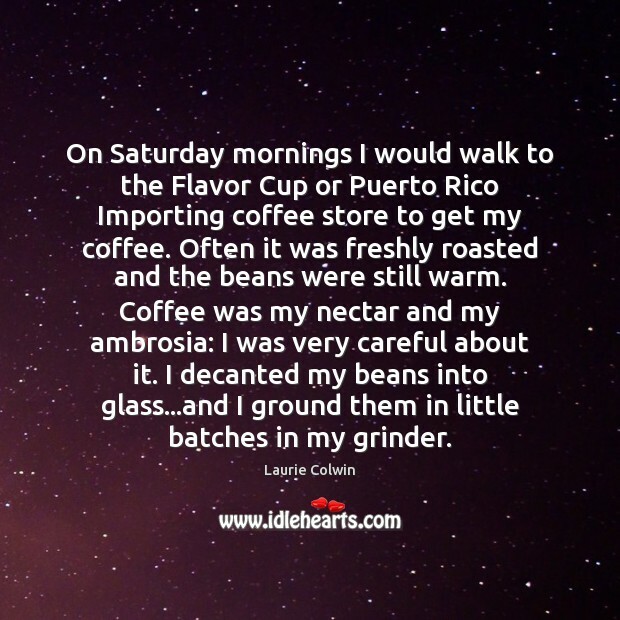 On Saturday mornings I would walk to the Flavor Cup or Puerto Rico Importing coffee store to get my coffee. Often it was freshly roasted and the beans were still warm. Coffee was my nectar and my ambrosia: I was very careful about it. I decanted my beans into glass...and I ground them in little batches in my grinder. 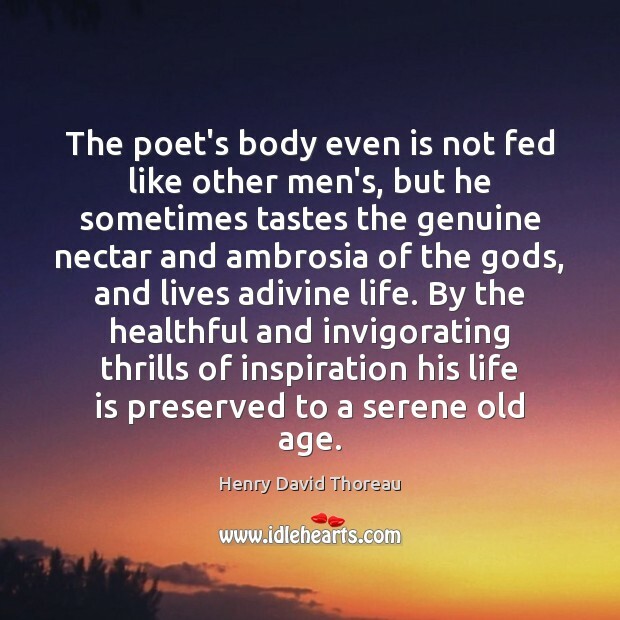 The poet's body even is not fed like other men's, but he sometimes tastes the genuine nectar and ambrosia of the gods, and lives adivine life. By the healthful and invigorating thrills of inspiration his life is preserved to a serene old age. You know what ambrosia tastes like? It tastes like all the things you can't eat on Weight Watchers. 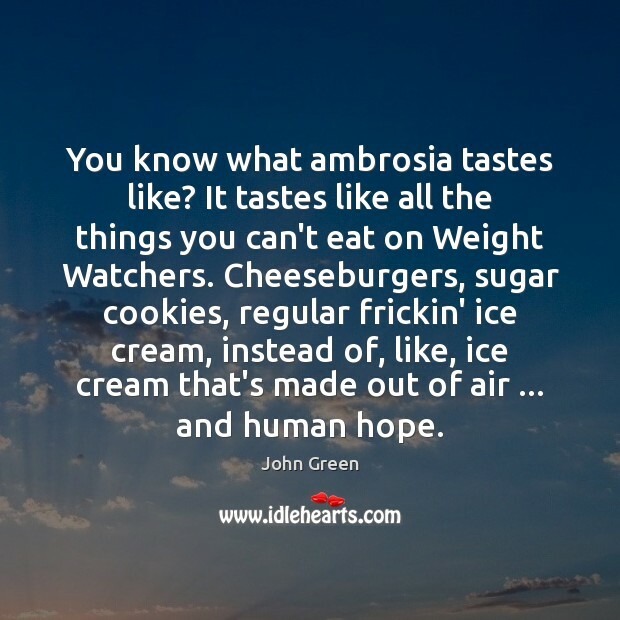 Cheeseburgers, sugar cookies, regular frickin' ice cream, instead of, like, ice cream that's made out of air ... and human hope. Millions of American women, and some men, commit that outrage every summer day. They are turning a superb treat into mere provender. Shucked and boiled in water, sweet corn is edible and nutritious; roasted in the husk in the hottest possible oven for forty minutes, shucked at the table, and buttered and salted, nothing else, it is ambrosia. No chef’s ingenuity and imagination have ever created a finer dish. 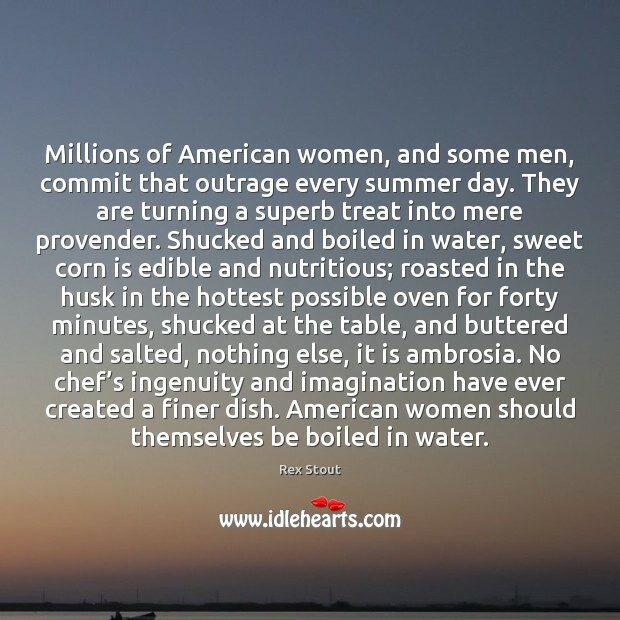 American women should themselves be boiled in water. 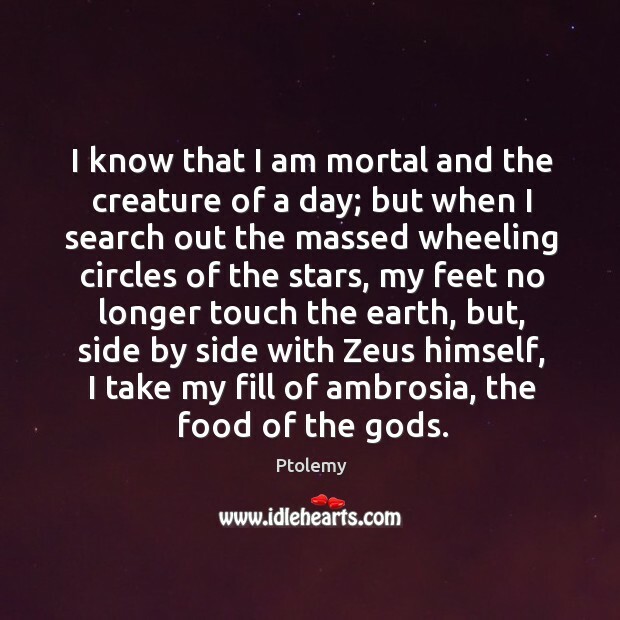 I know that I am mortal and the creature of a day; but when I search out the massed wheeling circles of the stars, my feet no longer touch the earth, but, side by side with Zeus himself, I take my fill of ambrosia, the food of the gods.